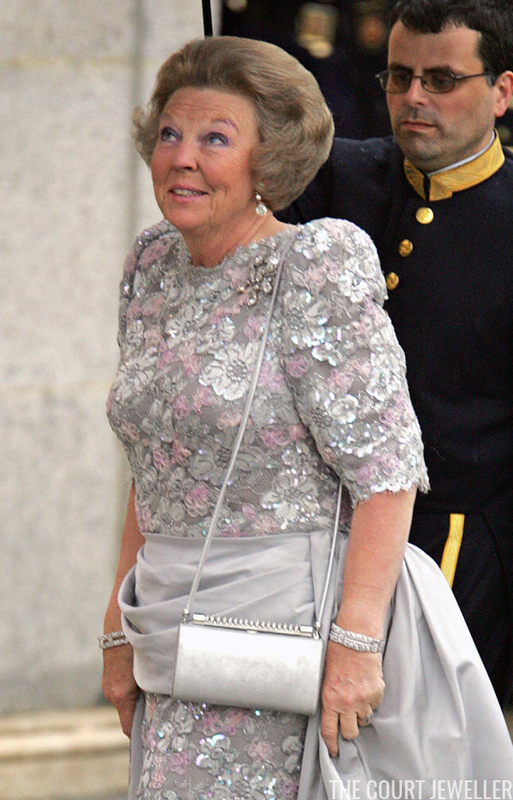 Queen (now Princess) Beatrix of the Netherlands wore diamond earrings and both of the East Indies Bracelets for the gala. 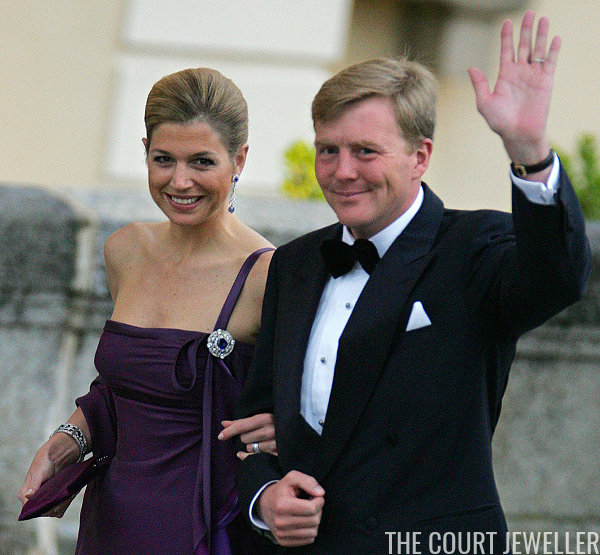 Princess (now Queen) Maxima of the Netherlands accessorized her deep purple gown with diamond and sapphire jewels, including drop earrings, a large brooch, and a bangle bracelet. Here's another view that shows some of the bracelet's details. 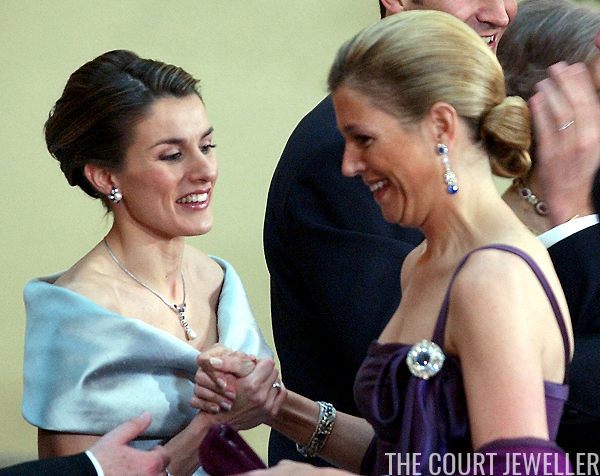 The Duchess of Brabant (now Queen Mathilde of the Belgians) wore her own diamond and pearl wedding earrings for the gala, as well as two diamond bracelets. Diamonds and emeralds were Grand Duchess Maria Teresa of Luxembourg's gemstones of choice, including her diamond and emerald earrings and a pair of diamond and emerald bracelets (including the one that I think may be an emerald watch!). Princess Caroline of Monaco wore a dramatic ensemble, accessorizing it with a pair of major statement earrings set with multi-colored gems. The diamond floral brooch pinned to her bodice is, I believe, one of the brooches worn by Princess Charlene in her hair on her wedding day. 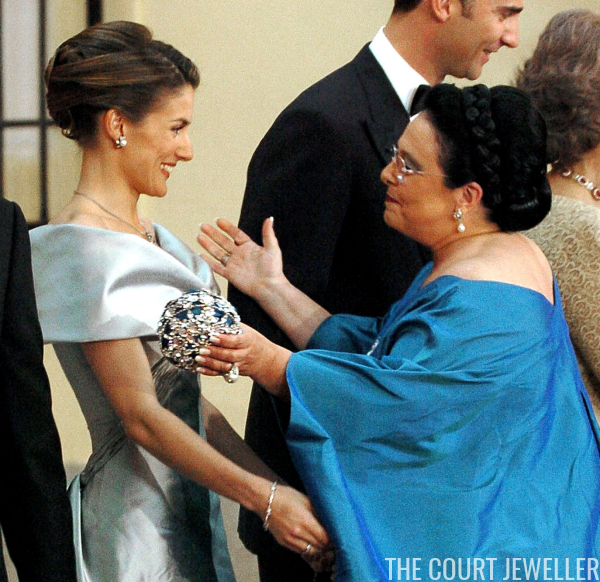 Queen Rania of Jordan was elegant in diamonds, including a pair of statement earrings and a modern bracelet. 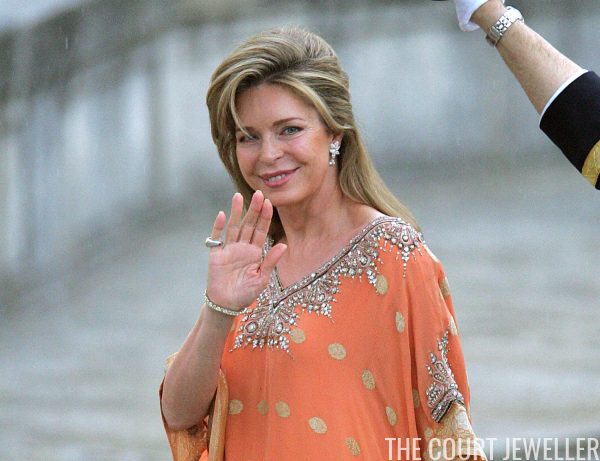 Rania's predecessor, Queen Noor, also accessorized with diamond pieces. 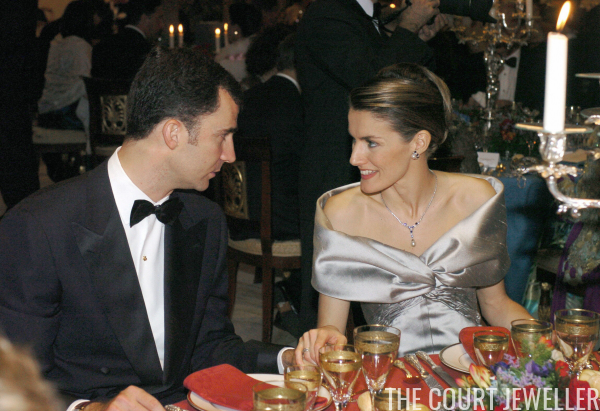 Gabriele of Leiningen, who was the Begum Aga Khan in 2004, wore some of her magnificent diamonds and emeralds for the gala. The suite of jewels, made by Cartier, was part of the auction of her jewels in 2016. Marina's daughter-in-law, the French actress Clotilde Courau, wore dangling earrings in shades of red and gold for the gala. 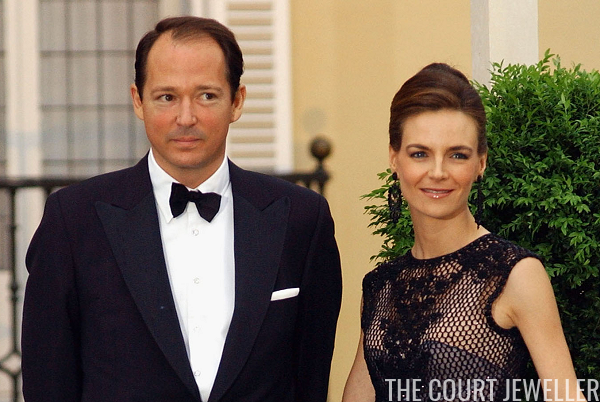 Members of one of the former royal families of France also attended the gala. On the right is Beatrice of Orleans the (now ex-) wife of Michel of Orleans, youngest son of the late Count of Paris. (Trivia fact: Michel's girlfriend before he married Beatrice was Princess Irene of Greece and Denmark, sister of Queen Sofia of Spain.) Beatrice wore a sparkling pair of earrings, but her daughter, Clotilde Crépy, wore an even more striking pair of earrings. 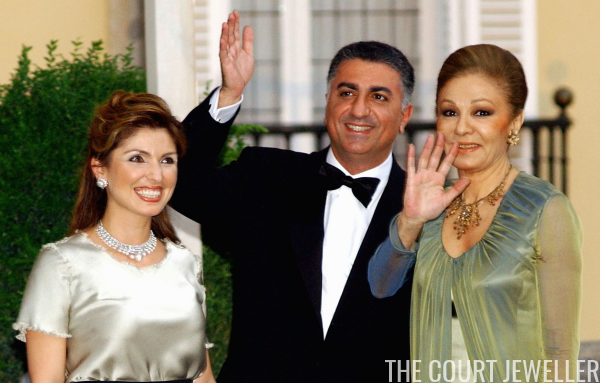 Farah Pahlavi attended the gala with her elder son, Reza, and his wife, Yasmine. Farah's jewels are golden in color, while Yasmine chose jewels set with diamonds and pearls. The former Bulgarian royal family is close to their Spanish counterparts, because the last King of Bulgaria, Simeon II, married a Spanish aristocrat, Margarita Gomez-Acebo. Their children have also all married Spaniards. 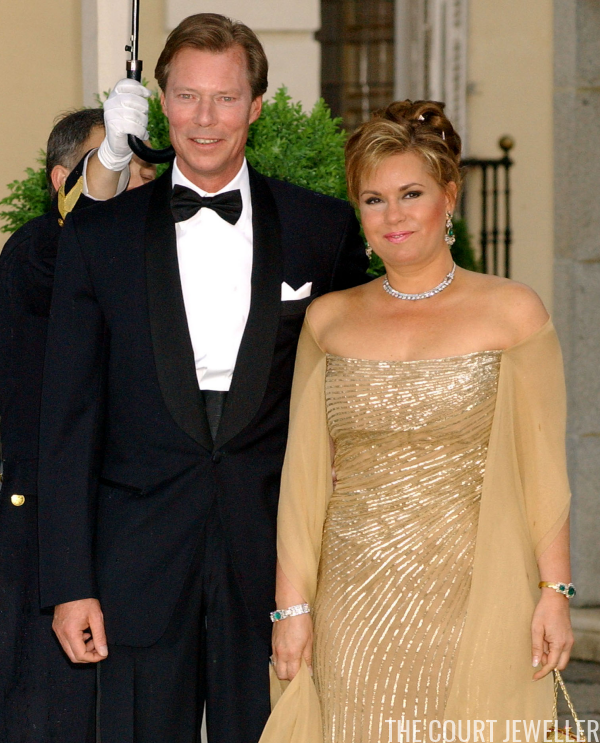 Above, their fourth son, Konstantin-Assen, is pictured at the gala with his wife, Maria Garcia de la Rasilla y Gortazar, who also has Spanish noble heritage. (Konstantin and Felipe are close; each has served as godfather to one of the other's children.) Maria wore a pair of dramatic beaded earrings for the gala. Konstantin-Assen's younger sister, Kalina, also attended the gala, wearing a suite of jewels set with blue and yellow stones. She is pictured with her husband, Kitin Muñoz, a Spanish sailor and scientist. And last, but of course not least, we've got Maria Vladimirovna of Russia, one of the claimants to the headship of the House of Romanov. She was born in Madrid and has spent much of her life in Spain. For this gala, she appears to have decided on earrings with a pearl drop.